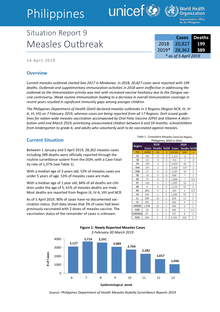 Current measles outbreak started late 2017 in Mindanao: in 2018, 21,812 cases were reported with 202 deaths. 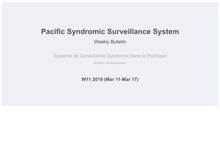 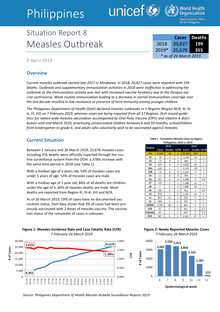 Outbreak and supplementary immunization activities in 2018 were ineffective in addressing the outbreak, as weak routine immunization system resulted in a decrease in overall immunization coverage. 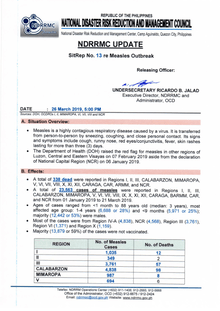 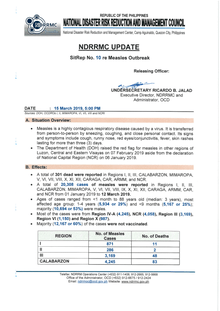 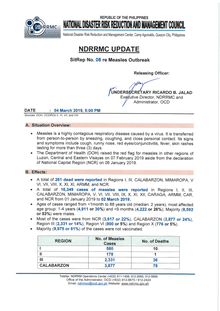 The Philippines Department of Health (DoH) declared measles outbreaks in 5 Regions (Region NCR, III, IV-A, VI, VII) on 7 February 2019, whereas cases are being reported from all 17 Regions. 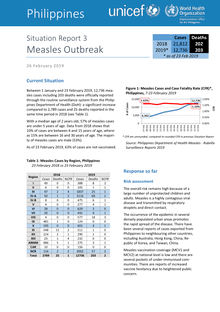 Measles is a highly contagious respiratory disease caused by a virus, It is transferred from person-to-person by sneezing, coughing, and close personal contact. 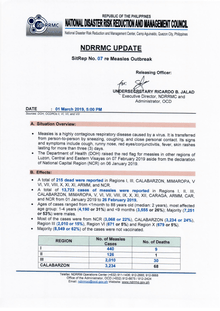 Its signs and symptoms include cough, runny nose, red eyes/conjunctivitis, fever, skin rashes lasting for more than three (3) days. 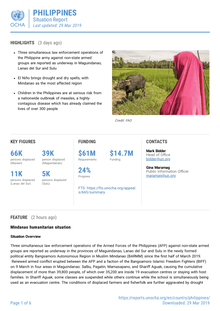 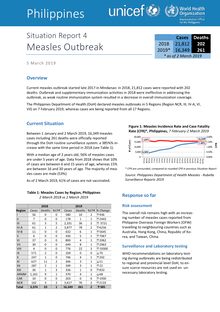 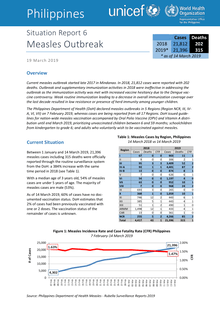 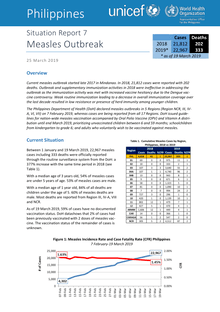 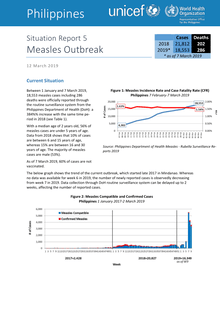 Between 1 January and 23 February 2019, 12,736 measles cases including 203 deaths were officially reported through the routine surveillance system from the Philippines Department of Health (DoH): a significant increase compared to 2,789 cases and 25 deaths reported in the same time period in 2018 (see Table 1).